I’ve been working on the IBM Graph Data Store for the last few months. It’s a nice place to build graph based applications, and last night I wrote a simple python app that takes a simple graph and visualises it. The Graph Data Store presents a simple REST interface. The credentials json file from the Bluemix dashboard gives you your username and password, and the URL of your instance. Make a copy of that in creds.json in the local directory. That POST's the Gremlin query to the service, raises if I get a non 2xx response, times how long the query took and returns the deserialised JSON as a python dictionary. A query against a graph store is known as a traversal. It finds elements of the graph matching certain parameters and iterates through the nodes and edges to find things that match the query. I’ve found that storing the steps of the query as a list is a nice way to write the thing in python, not least because the query can get long. 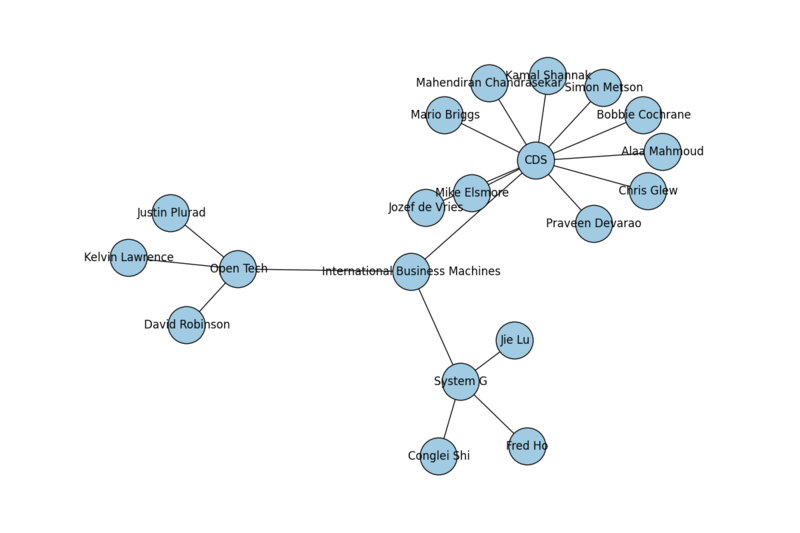 This gives us back paths out from the ‘International Business Machines’ node, via nodes that describe different groups to find people who work in those groups. It wraps matplotlib for visualising, but also provides some nice graph operations for analysing graphs in memory. First of all I create a figure object for matplotlib to draw on, then instantiate a Graph object to put data into. Then pull out the layout of the nodes, draw the visualisation, save it to a png file and show it in a window.